Don't put your whole life online! It's easy for all of us to want to interact with online friends by revealing details about ourselves. However, this gives potential cyberbullies all the ammunition they need to attack potential victims. And the worst part? Cyberbullies can choose to be anonymous while you are not. Keep any suggestive pictures, tweets, status updates, and so forth from making it onto your social networking profiles. If someone tags you in a picture you don't feel comfortable keeping online, ask them to take it down. It might be embarrassing at first, but it'll help your image in the long run and insulate you from mockery. If your child has already experienced some form of cyber bullying there are ways to take action to prevent any further harm. -Always tell the child that the harassment is not their fault and that they are fine the way they are. - Threats of violence are illegal and can be reported to the police. 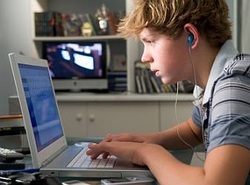 -Encourage the child not to respond to any online insults. -Since the bullying transpires online you can save any of the insults as evidence for prosecuting the bully into stopping. - Consider contacting the bully's parents. Results may vary.